Stage 4 is the most advanced form of breast cancer. It is also called metastatic breast cancer because it has spread (metastasized) beyond the original site in the breast to other organs in the body. Metastatic disease can be found in bones, lungs, the liver, the brain, and nearly any other region of the body. Stage 4 is often diagnosed when a recurrence of breast cancer is found, but it may also be how the cancer is initially discovered. Treatment goals will include controlling the spread of cancer and promoting good quality of life. While metastatic breast cancer is not curable, it is treatable and there are some long term survivors of the disease. Stage 4 breast cancer is a disease that is found after it has already traveled away from the breast to other areas of the body. Where breast cancer spreads can vary with the characteristics of the tumor. With intraductal carcinoma, the most common locations in order of spread are the bones, liver, lungs, and brain. Lobular carcinomas, in contrast, often spread to the abdomen. Based on receptor status, estrogen positive breast cancers frequently spread to bones (roughly 70 percent), whereas HER2 positive tumors are more likely than estrogen receptor positive tumors to spread to the brain. Different cancers also have different time frames related to growth and spread. Estrogen receptor positive tumors are often (but certainly not always) around 3 centimeters in diameter before they spread to distant organs. Even small (less than 1 centimeter) tumors that are HER2 positive may spread to lymph nodes or other regions. It's important to note that when breast cancer spreads to other regions of the body it is still breast cancer. For example, when breast cancer spreads to the lungs it is not lung cancer, but rather "breast cancer metastatic to the lungs." If you look at the cells in the lungs, they would be cancerous breast cells not lung cells. Stage 4 is scored T(any), N(any), M1 in the TNM system. These numbers refer to scores for the Tumor, Node Status, and Metastasis. Your tumor may be any size, your lymph node involvement may be none, or instead a large number of nodes. It is the Metastasis score that defines advanced breast cancer because a score of M1 means that the cancer has spread beyond the region of your breast and local lymph nodes, and is showing up in bones and major organs. A diagnosis of metastatic disease will also include hormone involvement, HER2 status, tumor grade, tumor size, and many other factors. Each case of metastatic breast cancer will be treated differently because of the variety of sites to which the cancer may spread. Your treatment plan will be customized to focus on limiting the spread of cancer and maintaining a good quality of life. This approach to treatment can be disconcerting to someone who was previously treated aggressively for an early stage breast cancer. In contrast, with stage 4 breast cancer the goal is usually to control the cancer with the least amount of treatment possible. People who have stage 4 breast cancer are usually treated with multiple"lines" of therapy, with the treatments that are considered most effective being used first line, and so on. 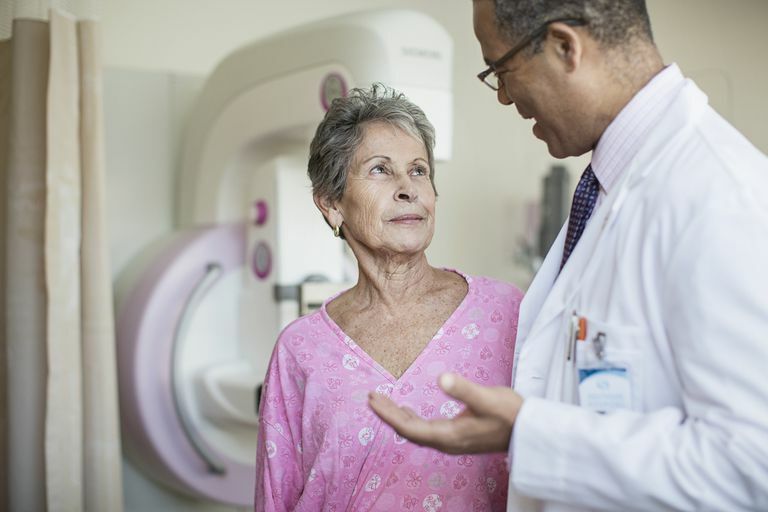 In addition to the general treatment options for stage 4 breast cancer noted above, treatments to address specific sites of metastases may be used. Bone metastases: Radiation therapy may be used to reduce pain or to prevent fractures. Bone modifying drugs may also be used. In addition to reducing pain, these drugs have anti-cancer effects. In fact, it's thought that they alter the microenvironment in bones so that cancerous breast cells can't "stick" as well, and can reduce the risk of further bone metastases. Lung metastases: If only a few metastases are present, surgery or a specialized form of radiation therapy known as stereotactic body radiotherapy (SBRT) may be used in an attempt to eradicate the metastases. Brain metastases: As with lung metastases, surgery or SBRT may be considered if only a single or few metastases are present. Liver metastases: Radiation or SBRT may be used to control symptoms related to liver metastases. Being diagnosed with metastatic breast cancer is quite difficult to process. The goal when managing early stage breast cancer is obtaining a permanent remission, e.g., a cure. But for stage 4, beating the beast is a daily and lifetime battle. It is not generally considered curable, but with new therapies, it may be treated as a chronic disease. The 5-year survival rate for metastatic patients is roughly 20 percent, though this varies by characteristics of the tumor, age, and much more. Some patients respond well to treatment and go on living for many years. Katharine Russell Rich, who chronicled her battle with breast cancer in The Red Devil, lived with metastatic disease for 18 years, making her a member of a very exclusive club. And syndicated liberal newspaper columnist Molly Ivins went for 8 years with Inflammatory Breast Cancer, but continued to work until two weeks before her passing. Some of your treatments can make you feel better—if a painful tumor shrinks in response to radiation or hormone therapy—you could feel great relief. But it is a fact of oncology treatment that many drugs will cause unpleasant side effects—nausea, fatigue, pain, neuropathy, mucositis, hair loss, constipation, and diarrhea. Try to keep a log of your side effects and bring it with you to your doctor visit. This will help them understand what you are dealing with. You can ask for palliative care to help you cope with these challenges. Medications, physical therapy and other counseling can be given that will help. It is natural to feel depressed, sad, anxious, or even angry when you are diagnosed with metastatic breast cancer. Most of us like to feel that we have some control over our health and our future, but cancer can remove our certainty, limit our plans for the future, and inspire fear in us and in those who care about us. When that happens, draw your loved ones close and find support. Stage 4 support groups welcome new members and are very understanding of your difficulties. Talk with your doctor and nurses about your feelings and ask for help. They may able to prescribe antidepressants, help you find a support group, or refer you to cognitive behavioral therapy or counseling. If you have trouble sleeping, seek out a yoga group or try good sleep hygiene. If your loved one has been diagnosed with stage 4 breast cancer, it's important to learn about the disease. Unfortunately, the public perception of advanced breast cancer is far from reality, and a cure is not yet available. As such, some of the comments a person might make to someone who has early stage breast cancer (such as "when will you be done with treatment) can be incredibly painful. Yet, saying something is always better than saying nothing, and your loved one needs your support more than ever before. It can be devastating to be diagnosed with stage 4 breast cancer, especially if you once had early stage breast cancer and thought you were cured. Fortunately, treatments are improving and newer treatments and being evaluated in clinical trials. The importance of support both from family and friends and from a support community can't be understated, and some studies actually suggest that the degree of support a person has when facing this disease has an affect on survival.